León, Archivo de la Catedral, ms. 8 > Antiphonarium mozarabicum > dated early 10th c. with additions dated 10th and 11th c. (around 1060). 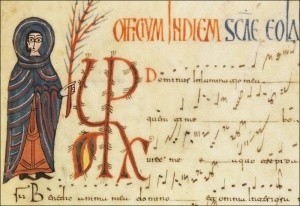 “The most complete antiphonary of purely Spanish liturgical use, with a total of 5000 responsories with verses… it stands out for its rigor in tonal organization, and for its range of notational signs…”. Zapke, Hispania Vetus, 252. Antiphonaries are codices which contain the sung portions of the Divine Office . Besides the illuminations that complement the texts, they are particularly relevant for their musical notation. These codices were highly appreciated by their contemporaries who acknowledged the specialised work done by the scribes who wrote them. I cannot read musical notation, but I can recognise the difficulty of its study. I cannot even think how challenging should have been to write and read notation in medieval times, when many users have problems just to read the texts! For being the result of collaboration among scribes, one for the text and another for the notation when it was not only one who wrote both (or even who prepared the parchment too), and illuminators, these codices are also appreciated for the information they can provide about their cultural context: about the scriptorium in which they were made and how the medieval work of writing a codex was organised and developed. © Ministerio de Cultura (BVPB). León, Archivo de la Catedral, ms. 8, fol. 9r. Calendar. (A) Fols. 1-3: Oficium de Letania (fol. 1r); epigram dedicated to the abbot Ikila (fol. 1v); Cyclus XXV annorum (fol. 2r); Prologus in libro Antiphonarium (fol. 2v); Admonitio cantoris sub metro eroico elegiacum (fol. 3r); Anuntiationes festivitatum (fol. 3v). (B) Fols. 4-19: Alpha (fol. 4v); Sacrum in diem Sancti Iacobi apostolic VIII Kalendas Augusti (fol. 5r); the Cross of Oviedo (fol. 5v); carpet Librum Ikilani Abbati (fol. 6r); Mozarabic calendar (fols. 6v-9r) and computation tables (9v-19v) – dated mid-10th century. Fols. 20-27: quires with the Computus Cottonianus. – added in the 11th century (dated c. 1060 by the scribe’s notes, see fol. 4r, 10v, 26r). Fols. 28v-306r: Antiphonarium mozarabicum. (It ends abruptly, maybe removing the colophon and a note about the ownership when it changed owner? Was this colophon a model for the epigram and illumination on fol. 1v? ) – dated early (first third) 10th century. © Ministerio de Cultura (BVPB). León, Archivo de la Catedral, ms. 8, fol. 56v. Antiphonary. For codicological problems with these contents, the initial plan of the manuscript and additions, see Díaz y Díaz, Incidental Notes. As a reminder, the manuscript was rebound in the 1950s. No. of leaves & layout: 306 fols. (330 x 240 mm); one 16-line single column for the Antiphonary, a variable number of columns and lines in the prologues, two columns-42 lines for fols. 20-27; quaternions (not regular); ruled in dry point; 39 quires. © Ministerio de Cultura (BVPB). León, Archivo de la Catedral, ms. 8, fol. 1v. Teodemundo and Ikilanus. Prologue: One or several unidentified hands (mid-10th century). Fol. 1, including the poem in the verso supposedly written by a scribe called abbot Teodemundo and the illumination which allegedly represents Teodemundo giving the codex to abbot Ikilanus (wrongly identified by traditional scholarship as abbot of León, 917-960 ?¿ depending on the source), was added, thus, after the antiphonary and the general prologue were copied. 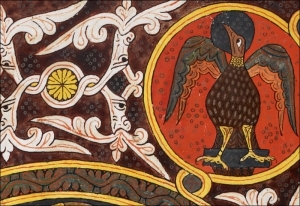 It is now believed that abbot Teodemundo commissioned to an unknown scribe to write this folio to be added to the codex he already had or maybe, less likely, to compose (i.e. to gather its parts plus the folio) the codex in full, to present it as a gift to abbot Ikilanus, in honor of whom the contents of 1v. – as well as the page tapestry fol. 6r. – were added . In other words, Teodemundo owned the Antiphonary, which was constantly being used since written, maybe adding some folios, and then, once Ikilanus expressed his wish to have it, instructed to add the ‘final touches’ on his honour. © Ministerio de Cultura (BVPB). León, Archivo de la Catedral, ms. 8, fol. 21v. Arias’ addition. Fols. 20-27: One, of several?, identified scribe: Arias Didaci, notary of Santiago de Compostela (Galicia) for Díaz y Díaz, scribe working for the royal chancery for Deswarte, who states his name and also his bibliographic interests in a note on fol. 12: Est liber storia eclesiastica que dicitur tripertita a tribus auctoribus de Grecia compositum, uno scilicet Teodorito sancto episcopo et duobus uiris Sozomeno et Socrater, incipiens a Constantino imperatore usque ad Teodosium iuniorem per multa interualla tempora. Cassiodorus senador accipiens per Epifanium scolasticum et dedit sancto uiro regi Teodosio. Ego Arias uidi ipsum librum in Francia, que nondum uideram in Gallicia. Antiphonarium: One or several? unidentified hands (first third of the 10th century; the neumes were written after the text, superimposed on it, and they perfectly correspond to each other). © Ministerio de Cultura (BVPB). León, Archivo de la Catedral, ms. 8, fol. 28v. Title. Illuminator/s: unknown. There is no specific program of illuminations drawn for this codex, although it has several, in the usual Mozarabic style. The most important are, besides the one in fol. 1v., the Alpha (fol. 5v), the Cross of Oviedo and the page tapestry Librum Ikilani Abbati (fol. 5v), the ornamented box with ownership mark (fol. 6v), calendar, solar wheels and computation tables (fols. 6v-19v). Initials with anthropomorphic, botanical and lacework motifs and historiated initials. Script: Visigothic cursive (in notes fol. 6v, 12r… ) and Visigothic minuscule scripts. Origin: The codex was written in the eastern part of the Leonese area. © Ministerio de Cultura (BVPB). León, Archivo de la Catedral, ms. 8, fol. 6v. Notes in Visigothic cursive script. I think this manuscript is a good example of the problems we have on codices written in Visigothic script (you can read a summary here). Until 2007 we all – more or less – believed Leon 8 was written in the mid-10th century by Teodemundo for Ikila. Now we know it was not, as well as that only the third part added by Arias can be accurately dated (mid-11th c.). Thus, the other two parts, the prologue and the antiphonary itself, are supposed from the first third of the 10th c. and the mid-10th c. respectively. Even so, the script of both parts has not been precisely described: Díaz y Díaz dated them by experience. I trust him, he is/was one of the masters, and one can be sure he made a thorough analysis, but I would like to see the facts and not only to believe his “palaeographical eye”. I would like to know what exactly characterises a script made in eastern Leon in those dates to be able to extrapolate the information to other codices. T. Deswarte, “Polygraphisme et mixité graphique. 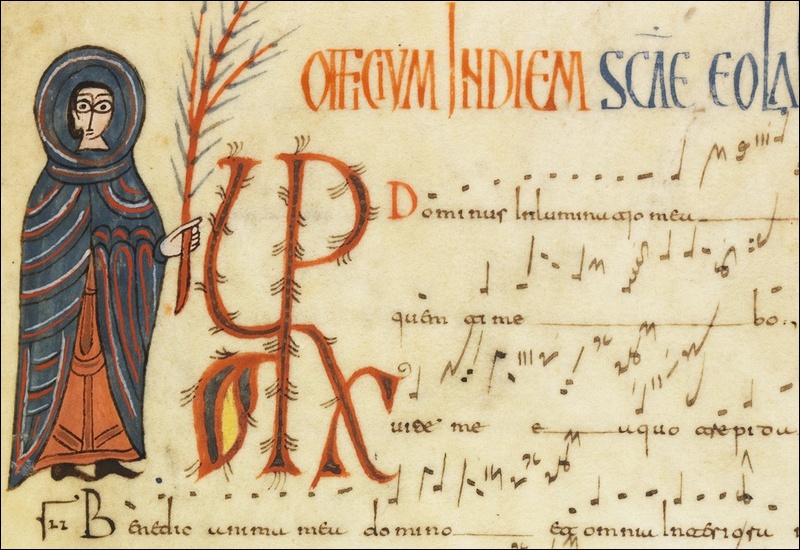 Note sur les additions d’Arias (1060-1070) dans l’Antiphonaire de León”, Territorio, Sociedad y Poder 8 (2013): 67-84. M. C. Díaz y Díaz, “Some Incidental Notes on Music Manuscripts”, in Hispania Vetus. Manuscritos litúrgico-musicales de los orígenes visigóticos a la transición francorromana (siglos IX-XII) ed. by S. Zapke, Bilbao 2007, 93-112. (see also 252 for S. Zapke’s report/file about the manuscript). M. C. Díaz y Díaz, Códices visigóticos de la monarquia leonesa, León 1983, 308-309 – nº 14, 390-391 – nº 98. A. Millares Carlo, Corpus de códices visigóticos (ed. by M. C. Díaz y Díaz, A. M. Mundo Marcet, J. M. Ruiz Asencio, B. Casado Quintanilla, and E. Lecuona Ribot), Las Palmas de Gran Canaria 1999. Digitised (Biblioteca Virtual del Patrimonio Bibliográfico). See Michelle P. Brown, Understanding Illuminated Manuscripts: A Guide to Technical Terms (J. Paul Getty Museum: Malibu and British Library: London, 1994) available online for this and other terms used in describing codices. The poem says: “Very great merit have you obtained with this gift, O Abbot Teodemundo, you who dwell here with your good monks and will in the future revel with the angels. Shining even brighter thanks to your wishes. O abbot Ikilanus! You can now see that what had been your desire is finished; look again and again at the book prepared for use; illustrated and decorated in gold. May I deserved to be helped by your prayers: remember me, the copyist, forever, he who has worked so hard out of respect for your name”. Al fin encuentro a alguien que narra la historia de Iberia en ingles, sin prejuicios y con excelencia. Como norteamericana, le dire que la historia de Iberia y de latinoamerica en general que se ensena en nuestras escuelas siempre ha estado llenos de falacias y prejuicios, con una marcadisima influencia britanica. Gracias y mucho exito! Fantastic info! I’ve been wanting to learn about this book for a long time. Yes; it also has several notes written during the 10th and 11th on correspondences. You can read ‘Incidental notes’ online (Hispania Vetus is on GoogleBooks). Muchas gracias Lulee. Voy combinando historia y paleografía tanto como puedo y sé. Me alegro de que te resulte amena la lectura.